On a sunny afternoon in early April at the University of Washington Botanic Gardens, a group of twelve students crowd around a three-foot-deep hole in the ground and peer down quizzically as I scrape the fresh face of the soil profile with a trowel. “What horizon is this?” I ask, pointing to the dark, rich organic layer at the surface. “An A horizon?” one student offers. 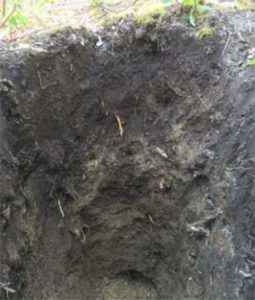 Image above: Soil profile at the University of Washington Botanic Gardens. Soil is the Alderwood series, which occurs frequently throughout the Seattle area. This profile has a relatively deep A horizon due to the application of compost by the Botanic Garden staff over the years. One of the foremost jobs of a soil scientist is to identify different layers in the soil, what we call horizons. There are many types of horizons, each with unique features that result from the complex interaction of the soil with the organisms that grow within it, the type of rock that underlies it, the climate that brings rain or sunshine upon it, and the time that the soil has been left undisturbed. Teaching students to identify different horizons is key because these layers in the soil can communicate information about how productive the soil can be, the type of minerals that are present, or even if the soil is periodically saturated with water. The Munsell color book is an essential tool for teaching (and for research) because it provides an objective scale to identify the color of different horizons. Later in the quarter, I took students up to the North Cascades to see some high elevation soils. These soils look nothing like the soil at the Botanic Gardens; instead of blacks and strong browns, the soil starts black but quickly changes to a light grey before shifting to dark red and finally lightening to a yellowish brown. Soils of this type, called Spodosols, are some of Earth’s most photogenic. 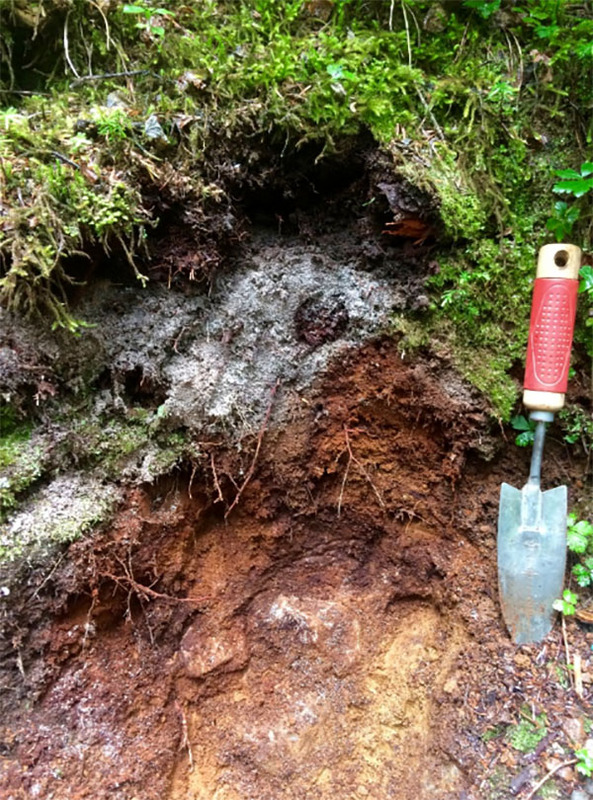 Soil profile of a Spodosol near Snoqualmie Pass, WA, along the trail to Franklin Falls. The grey horizon has been leached of iron and organic matter, which has precipitated below it. The soil also contains ash from recent volcanic eruptions in the region including from Mount St. Helens in May 1980. The community of plants growing between different soil types can change dramatically. The soil at the UW Botanic Gardens will support a broad variety of plants, although the gardeners apply ample compost to the soil to increase the quality of the A horizon for plant nutrition. By contrast, the Spodosols supports trees like Pacific silver fir, mountain hemlock, and western red cedar which can tolerate highly acidic conditions. By teaching students to identify different types of soil through horizon identification, they can begin to understand what drives the distribution of trees across the landscape. Eventually, these students will be charged with managing and maintaining these forests for the essential services they provide: growing wood for buildings, filtering water, even sequestering carbon to combat climate change. With a Munsell soil color book in hand, they can use their knowledge of soils to make decisions about the fate of these forests to sustainably balance human and ecological needs. 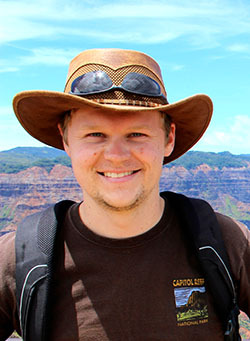 Jason James is a soil scientist and PhD student at the University of Washington. He works with forest soils across the Pacific Northwest, and recently returned from a research trip to Brazil to study deep, ancient, tropical soils. When not digging, he can be found wandering through the sundry ecosystems of the American West, or with his nose tucked into a good book (the Martian by Andy Weir is a current favorite). Are you passionate about engaging communication of science to public audiences? Interested to learn more about what UW graduate students are working on? Check out engage-science.com, which features stories from graduate students in many scientific disciplines (including Jason) and public presentations about their research recorded at Town Hall Seattle.